Much of the recent attention in the mobile display market has been focused on OLED technologies, with Samsung continuing to impress with its curved technology and LG Display investing heavily in new production lines to catch up with the market leader. Talk of the town very much suggests that, at least in the high-end space, OLED is very much the future and LCD is on the way out. You only have to look at market forecasts for OLED panel shipments to see where the big growth is expected to come from, although that doesn’t mean that LCD demand is necessarily going to fall at the same rate. LCD technology certainly isn’t down and out yet, and there are a number of perhaps more obscure technical reasons why the technology might yet see some momentum swing back towards it. Very few would complain about the quality of today’s high-end smartphone screens, but the almost universal adoption of a QHD resolution and the new emerging trend for HDR content do present some very specific challenges in small smartphone form factors. The biggest one of these is display brightness. The issue is that neither LCD nor OLED panels offer 100 percent efficient light output. Some of the light produced is lost or blocked by other essential display components. In the LCD space, the backlight has to pass through filters, which aren’t 100 percent efficient, and the pixel controlling transistor also takes up a notable amount of space that blocks some light in every sub-pixel. Different backplane technologies, such as a-Si and LPTS, change this pixel “aperture”. However as panel manufacturers increase the resolution, more of the light is obscured by these these fixed size transistors. Transistors are required to drive each colored pixel, but, as you can see, they partially block the LCD backlight, reducing the amount of light that reaches the viewer. OLED is not immune to this problem either, although losses come in a different form. Each pixel also requires a complex transistor layer but this is hidden under the light emitting part in an OLED panel. Even so, close groupings of the TFTs cause resistive and capacitive energy losses, meaning more power required to drive the same brightness at higher resolutions. A reflection mitigating polarizer is also needed, which again isn’t fully efficient and also causes some light loss. So the higher our display resolutions more power is required to drive a display’s LEDs or backlight to achieve good visibility in daylight, and the more power the display consumes. The move towards HDR content compounds this issue, with darker blacks and brighter whites required to increase dynamic range. Clearly, that’s directly opposed to consumer demands for better battery life, but there are some technological innovations that can address this very issue. duce the transistor sizes or find a way to increase display brightness further. Indium gallium zinc oxide (IGZO) semiconductors can be used not only to significantly reduce the transitory size, and therefore increase sub-pixel aperture, but can also push down power consumption due to increased electron mobility over low cost a-Si alternatives. This solves most of the issues, but not many manufacturers have the yields to mass produce these panels at the required volumes yet. Display maker Sharp has already demonstrated this technology and is building incredibly pixel dense displays for the virtual reality market using IGZO. In a smartphone form factor, it seems almost inevitable that other LCD manufacturers will move over to this technology as the pressure to increase display resolution continues and manufacturing yields improve. LG Display has mentioned to us that it envisions transitioning over to IGZO-TFT once it’s refined its implementation, although we don’t know how long this will take and if it will be used for mobile screens. 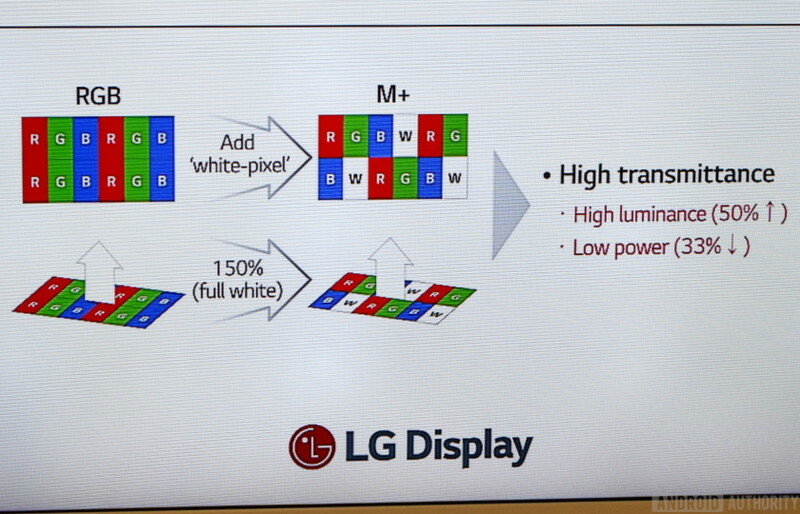 RGBW display designs, such as LG Display’s M+ sub-pixel technology, offer an alternative solution. MLCD Plus introduces a dedicated white pixel into the usual red, green, blue makeup of a display panel. Instantly, this grants a major boost to display brightness, which is very helpful for improved readability in outdoor environments and for displaying HDR content on very compact displays. Given that we know color filters are inefficient, LCD panels waste a lot of light when displaying a white image, which requires red, green, and blue pixels to be turned on. Using a white pixel sans-filter layer means that we can turns the RGB pixels off and reduce the display brightness to achieve the same result. Alternatively we can turn all the pixels on for a brightness boost. We’ve only seen M+ used in the TV space so far, but a 5.5-inch mobile prototype is set up in LG Display’s Paju showroom showing off some impressive power metrics. LG Display states that MLCD Plus can reduce typical power consumption by 35 percent while retaining brightness, or boost brightness by 50 percent for the same power consumption. However, the demo unit that was displaying mostly white content at equal brightness was able to cut power consumption by roughly 50 percent. If we consider that most web pages and apps display a white background the majority of the time, we could be looking at up to a 50 percent display power saving in many smartphone use cases. This won’t translate directly to extended screen-on time given other variables, but anywhere between a 25 to 33 percent battery life improvement seems achievable and would be very welcomed by power users. LG Display engineers also tell us that power consumption is lower than OLED displays too. As well as decreasing power consumption, the 50 percent boost to peak brightness is also very helpful for outdoor viewing and the trend towards HDR content. As I’ve mentioned, displaying HDR content requires a display to be able to produce a wider range of steps between black and peak brightness, and boosting the maximum brightness is one way to do this. This is particularly important in the LCD space, where blacks aren’t as deep as OLED. So, technologies like M+ could be picked up by phone manufacturers looking for an LCD panel that offers a brightness boost when playing back HDR video. Now of course, MLCD Plus isn’t without a small compromise. Based on the RGBW pattern above, M+ introduces a white pixel every fourth sub-pixel, meaning that over the course of 12 sub-pixels there are now only 3 of each RGB components plus 3 white components, as opposed to 4 of each red, green, and blue. So, there’s potentially an issue with color balance, that has to be addressed when driving an image to the display, although this didn’t seem to be a problem on the TVs we saw. Secondly, this extra white pixel has some implications for resolution. With a third fewer RGB pixels to highlight details in mixed color images, technically RGBW does sacrifice some contrast detail resolution in order to boost brightness. Please note though that OLED displays also commonly play around with different sub-pixel layouts too, which makes counting and comparing RGB components a little futile. The Samsung Galaxy S8’s panel still uses a RGBG diamond PenTile matrix, for example. It’s worth pointing out that the ICDM defies resolution as the number of lines and spaces that may be resolved with a minimum Michelson contrast, and RGBW sub-pixel designs meet this criteria for display 4K content. That being said, in smartphone form factors where a QHD resolution already suprasses our ability to discern individual pixel details even on 5.5 and 6-inch displays, these type of trade-off are highly unlikely to make any visual difference in terms of detail. So RGBW sub-pixel displays are arguably more suited to mobile displays than TVs, as phones can benefit from the extra battery life and the displays are small enough that sacrificing some pixels to an alternative function won’t make a perceivable difference to fine details. OLED has certainly had the momentum this year, and the technology correctly has its upsides, particularly when it comes to increasing color gamut and meeting the requirements of HDR. However, as much attention as OLED received of late, LCD technology continue to innovate too. With Quantum Dot pushing color gamut, and ideas like RGBW and superior transistor technologies improving brightness and power consumption, LCD continues to put up a good fight. With product developers no doubt keen to push display resolutions even higher, especially if they’re to cater to the demands of virtual reality, and producers reading high dynamic range content for consumers, the display market landscape is in the midst a shift once again. Not forgetting the never ending battle against battery life in the mobile space too. It’s going to be up to OEMs to pick out the best technologies for their products going forward, and it wouldn’t surprise me if we continue to see a mix of OLED and LCD implementations.